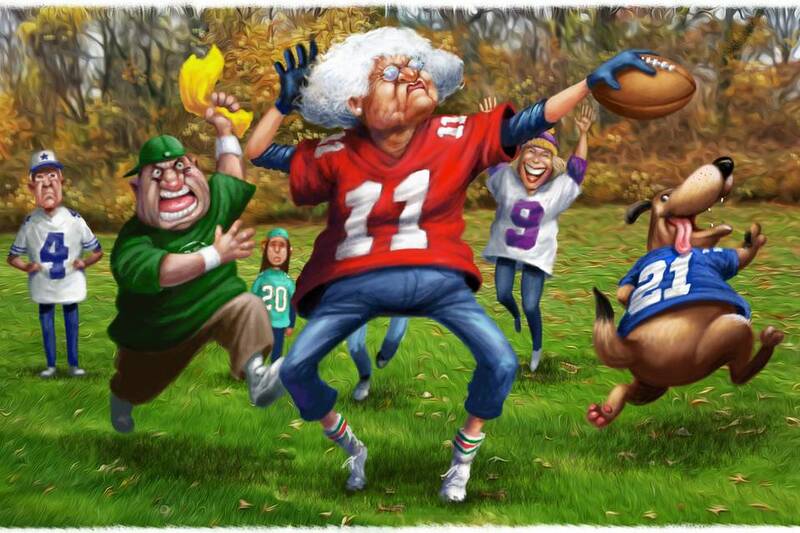 Once a year, we take time out from our weekly narrative to enjoy the holidays, say thank you to our clients and readers, and share Jason Gay’s hilarious rules for Thanksgiving Touch Football. –This is Peyton Manning’s first Thanksgiving as a retired football player, which means: he is going to be an utter nightmare at the Family Thanksgiving Touch Football Game. – If you’re playing in the Dallas area and a guy named Tony walks up and wants to join your touch football game, give him a few reps at quarterback. Guy has had a tough couple of months. It’s the least you can do. Honorary mentions include #2 and #14. Happy Thanksgiving and have a blessed Holiday season. Will the family game be more contentious than the election? Will Tony Romo show up? And where’s the bourbon? Thanksgiving is upon us, and everywhere you look, there are nervous warnings to steer the dinnertime chitchat away from current, controversial topics like You-Know-Who. This is dull, timid advice. Assembling family and friends, eating too many carbs, overdoing it on box wine, and launching into loud, uncomfortable arguments that never reach a resolution and may conclude with a wrestling match spilling into the kitchen—that’s the magic of Thanksgiving! If you really need to release some Thanksgiving aggression, there’s always the family touch football game. This is the Journal’s sixth edition of the Rules for Thanksgiving Family Touch Football, which can only mean one thing: I am running this gimmick straight into the ground. Still, I want to thank every Journal reader who asks for it, passes it on to family and friends, and even sends me the score of their family game. I am honored you have made this a tradition, and as always, I assume no responsibility if you tear an ACL. 1. Let’s get this out of the way: Nobody needs to talk about the 2016 Presidential election during the Thanksgiving touch football game. The election should only be discussed during dinner, after the guests have had at least six cocktails, all glassware and sharp cutlery has been removed from the house, and everyone at the table is wearing a hockey helmet. 2. There is no warm-up for family touch football. Look, buddy: Dad just got up off the couch for the first time in three hours. He’s warmed up. Let’s get this show on the road before his lower back seizes again. 3. There’s someone at your Thanksgiving touch football game who does not know how to play football and really isn’t interested in joining the game. Please know: This is your best available option at quarterback. 4. There’s also an old Basset hound next door named Skippy, who barks at the garbage truck and licks peanut butter straight out of a jar. Skippy is your second best quarterback. 5. Skippy is also the second best quarterback on the Cleveland Browns. 6. If you’re playing your family touch football game at Mar-a-Lago, I’d ask Ivanka to play QB. Nothing personal against the other players. Just like Ivanka at the helm. 7. Your cousin Tammy has brought her new husband, Big Randy, who was an all-Big Ten linebacker and actually played a season on the practice squad with the Packers. There’s a lot of pressure on Big Randy to show what he can do on a football field, without maiming anyone in his new family. 8. Hey, look—Uncle Kenny lost some weight! He’s been taking CrossFit classes, which he’s only mentioned 137 times since arriving. 9. Also, don’t ask Uncle Kenny about his fantasy team. Not unless you have three hours to spare listening to why he passed over Devin Funchess in the seventh round of his fantasy draft. 10. Please avoid that giant bubbling tub in the driveway. That is not a garbage barrel. For the 10th year in a row, your cousin is trying and failing to deep fry a turkey with that recipe he found on the internet. 11. If it looks like a catch, it’s a catch. What is this, the NFL? 12. Still confused about a catch? Ask the cat. The cat has as good an idea as anyone at the NFL. 13. Yes, the NFL is cracking down on end zone dancing—but how dare you throw a penalty flag on grandma’s touchdown celebration? She’s been working on her “Pepperidge Farm Shake” for six months, and besides, I think she just broke her hip. 14. Your mom is a wise and loving person, and you’d think she isn’t holding it against you that you’ve dropped two passes in the end zone. But she is. She definitely, silently is. Mom wants a W.
15. Actually, I heard you played very well in the Thanksgiving touch football game last year, and you’re the best player in your family. 16. Whoops, that’s just some fake news I found on Facebook. 17. Your Thanksgiving game will be watched by two toddlers, six squirrels, and a passing hawk. Yes: Your family touch football game has the same audience as Thursday Night Football. 18. Avoid any family members with connections to Michigan and Ohio State. They have a big game Saturday, and they’ll want to talk endlessly about how their school invented football. 19. To please the NFL, we need two teams to play a crummy Thanksgiving touch football game in London. 20. This is Peyton Manning’s first Thanksgiving as a retired football player, which means: he is going to be an utter nightmare at the Family Thanksgiving Touch Football Game. 22. If you’re playing in the Dallas area and a guy named Tony walks up and wants to join your touch football game, give him a few reps at quarterback. Guy has had a tough couple of months. It’s the least you can do. 23. This year’s halftime show is everyone quietly discussing the neighbors’ divorce. 24. Important note: This year the Chicago Cubs won the World Series, Cleveland won an NBA title…and the Detroit Lions have won five of six and are now 6-4 and in first place in the NFC North. I’m just putting that out there for when someone invariably dumps on the Thanksgiving Lions game. 25. Do the Lions know everyone falls asleep in the Thanksgiving Lions game? Thanksgiving Lions football is like “Twinkle Twinkle Little Star” for adults. 26. The game is over when ESPN’s Adam Schefter tweets that Dad has fired himself and is drinking beer in the garage. 27. Finally, don’t talk about the score of the game at Thanksgiving dinner. Discuss safer, quieter topics, like You Know Who. I wish you all a peaceful Thanksgiving, full of good food and the love of family, and most important, a great touch football game. If inspired, send me a photo and the score of your family game and Journal Sports will publish them online next week. Reach me at Jason.Gay@wsj.com or tweet to @jasongay. Lastly, in these unsettled times, can we all agree on one important thing? The kids need to do the dishes. It’s good for America and good for them.